One of the important steps in choosing some simple science fair projects is to observe your environment and pose questions and then make predictions. Then you follow the steps to a good scientific experiment using the scientific method, and explore it and either prove or disprove your predictions. Doesn’t this sound so simple? Simple that is until it is your kid sitting there saying, “I don’t know what to do…” or “I don’t know what they mean to look around….” One of the problems is everyone over thinks this step and thinks it has to be some fancy science concept, rather than a simple question you probably have asked a million times yourself, without realizing it is the seed to a great, quick and easy science fair project. What is something all kids like and teachers do everything possible to keep it out o school? Study what the different temperatures of water does to the gum. Hopefully you can see the makings of a great project, and how cool the charts and display will look when you are finished. You pick one type/brand of gum to begin with. Make a list of the attributes taste, can you bend it, ease of chewing, how long the flavor lasts, can you blow bubbles, and whatever the kids come up with. Then with cold, warm, hot and boiling water keep track of the difference it makes with each attribute and chart it. You should be able to make a conclusion on what water does to gum at these temperatures. Once you do that, older students might want to take it a step further and expand and do the same thing with different brands, sugarless, fruit flavored, bubble gum, gum balls, etc to see if it does the same thing to all gum, or whatever. How fun the display board will look with all those different types of gum and the charts! This is a simple example of looking in your environment, posing a question and experimenting with it. 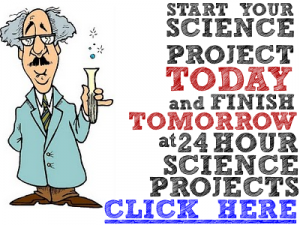 It is quick, simple and a great way to learn how to use the steps to the scientific method, without even realizing it. When you think about it, you run into these simple little questions all the time, particularly in the kitchen. Does hot or cold water make the brownies better? How fast do ice cubes melt in different temperatures? Which brands of bread molds faster? and Does putting it in the refrigerator do any good? These are the kinds of questions that come up all the time and make great science fair projects. Discover a great source with a supply of these quick, simple science fair projects that are kid tested and teacher approved with this link.